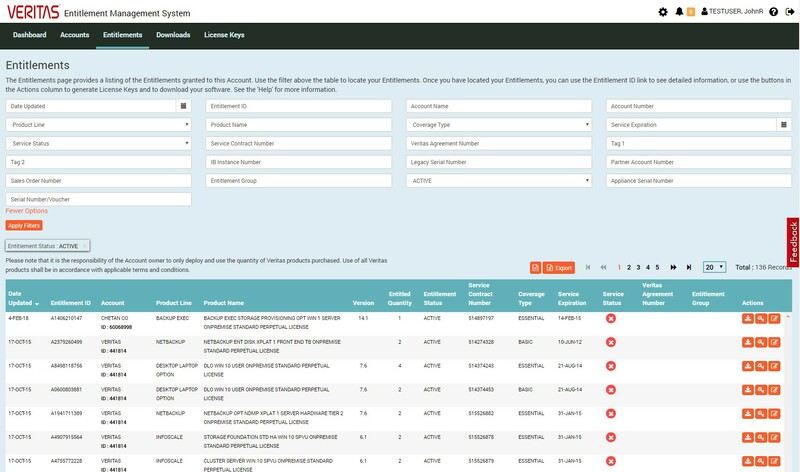 This article provides details on how to locate and download the licences and installation files for Backup Exec from the Veritas Entitlement and Management System (VEMS) website. Portal users that cannot see the expected information within specific sections of the portal or those that are having difficulty accessing the portal should review the more detailed information within the VEMS Guide and may have to contact our Customer Care team to resolve their issue, as members of Technical Support are unable to directly assist with portal issues. Note: In order to make some screens clearer in this article most images are cropped to remove unimportant detail from near the edges. a) Enter support.veritas.com into your web browser and click the ‘User’ icon to log into your Veritas Account. b) Enter your Veritas Account credentials and click ‘Submit’. If you don’t already have a Veritas Account, then click ‘Create Account’ to register. c) This will result in being logged into your Veritas Account. Click the ‘Licensing’ icon to enter VEMS. 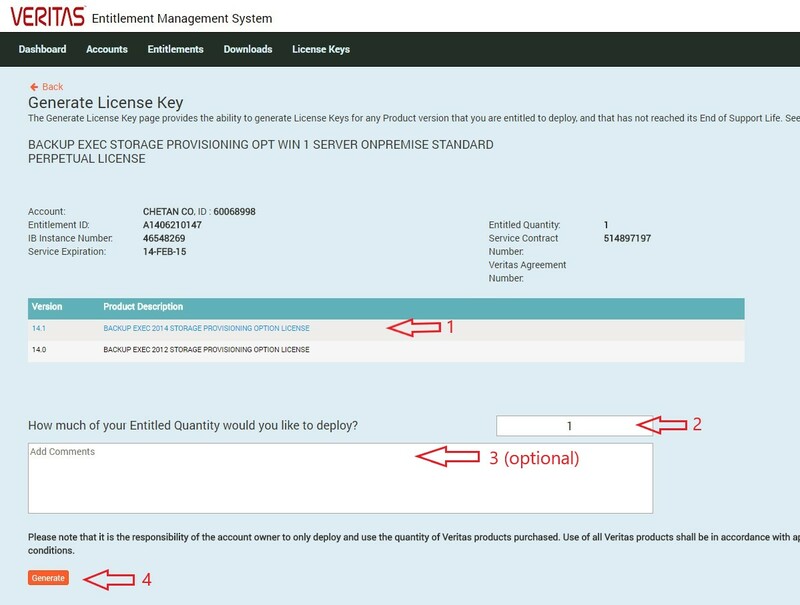 e) Within the Entitlements section, apply any appropriate filters and/or scroll down to locate the available entitlements for the required version of Backup Exec. 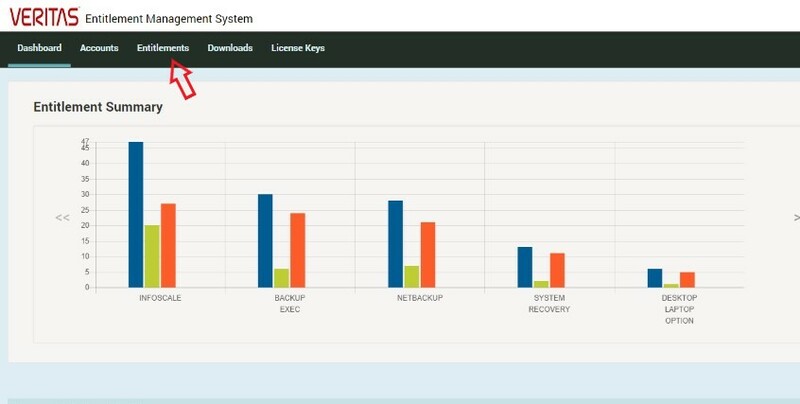 Depending on the licensing edition purchased, multiple entitlements may exist that cover the Backup Exec Server(s) and all the separate agents and options for the specific Backup Exec version. a) To generate a Backup Exec License Key, click ‘Generate License’ in the Actions column against the entitlement (hover the mouse pointer over the buttons to identify the correct button). Note: In environments with smaller screen resolutions, the Actions column may be off the right side of the screen, and require a scroll to the right to locate the action buttons. Additionally (depending on resolution and number of entitlements) the left-right scroll-bar may be off the bottom edge of the visible screen, and require scrolling down to use. b) On the Generate License Key page. - Specify the quantity being used from the entitled amount. c) The Generated License Key page will be displayed with the details for the new License Key. Click ‘Save License’ in the Actions column to save the License Key to the local file system. Click ‘Email License’ to receive the License Key via email. Note: Generated license keys are available in the Licenses Keys tab of VEMS. Please review the VEMS Guide for details of abilities available in the License Keys section of VEMS. a) Select the Downloads Tab and then choose the correct account before setting the Product Line to Backup Exec to filter the list. Note: The list will show entries for all entitlements for a specific version, however, for Backup Exec, the downloads available for every entitlement are the same files, resulting in only needing to download the media (for a given version) once. c) Check the box next to the required download(s) and click Download. For Backup Exec there may be file choices that include a smaller executable patch file and a larger ZIP file (containing the complete ISO for the product installer). If planning to upgrade an older (major) version or performing a new installation, then the complete ISO is required, if intending to patch an existing installation running the same major version then the patch file will be required.